Hello! 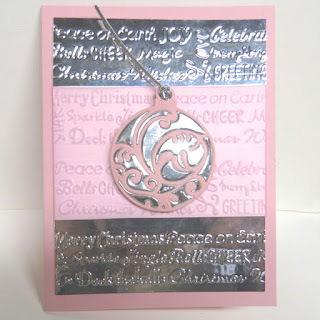 I am back with another Pink and Silver Christmas card using some leftovers from yesterday's card. To this card, I added an embossed layer of Silver Metallic CS which I wrapped the center with Pink Vellum so the attached ornament would shown better. I've included 2 photos to show from different angles. It is so difficult to capture Metallic CS without glare. 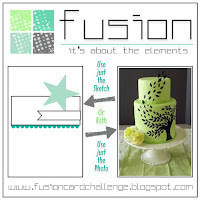 Card & Papercraft Embossing Border(freebie with magazine); Silver Twine; Fun Foam. Hello! Today I have 2 One Layer cards using the same stamps and similar layouts but added an extra tree to the winter one using masking. Stamps used are from Gina K's The Northwood set. I decided to make one for Fall and one for Winter. 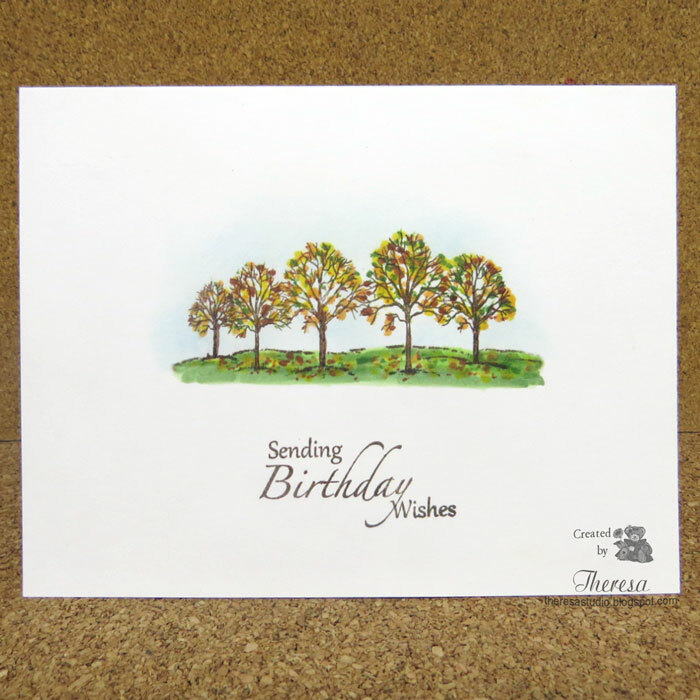 I may make more for Summer and Spring and use for a card set of birthday cards. Supplies Used: White CS; Memento Rich Cocoa, Summer Sky, Paris Dusk Inks, SU Bordering Blue Ink; Memento Markers, Stickles Frosted Lace, Liquid Pearls. Double D Challenges: Trees, Trees, Trees. I was inspired to make 2 cards. 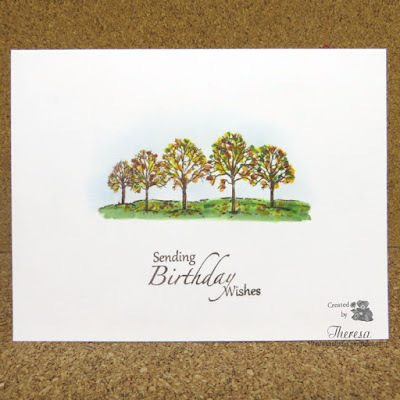 Crazy 4 Challenges: C4C355 Make a birthday card. 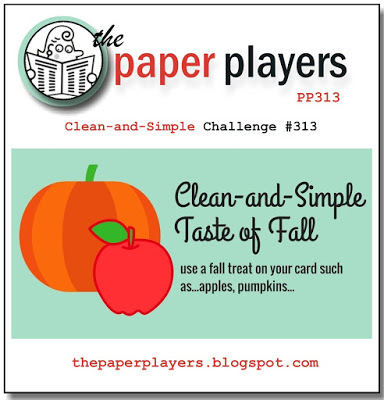 CAS on Sunday: Challenge 92 Make a one layer card. 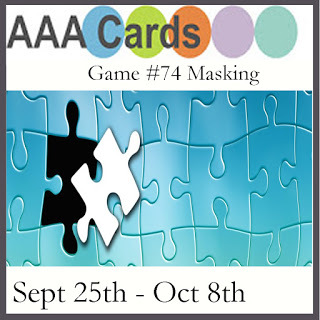 AAA Cards: Game 74 Masking. 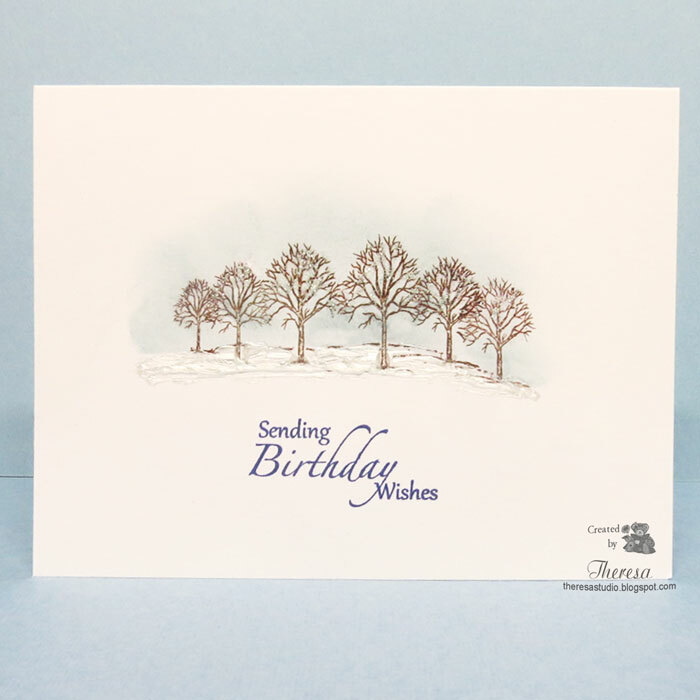 Used masking to add a sixth tree to the CAS Winter card. Welcome! This is my second post of the day. I was playing with the color challenge at Pals Paper Arts shown below and came up with this design. 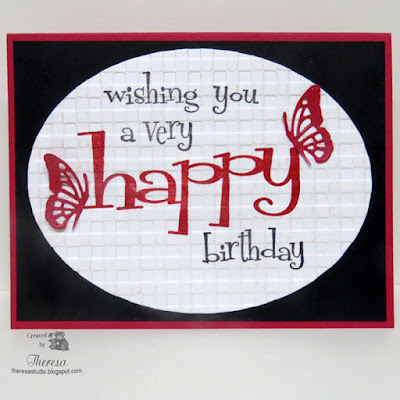 I used Gina K Designs stamps from Wild Blossoms and Tiny Textures. I stamped the "Splatter" with SU Sage Shadow ink and then used SU Regal Rose and Glorious Green inks for the blossom and verse. I think the colors match up well enough for the challenge. 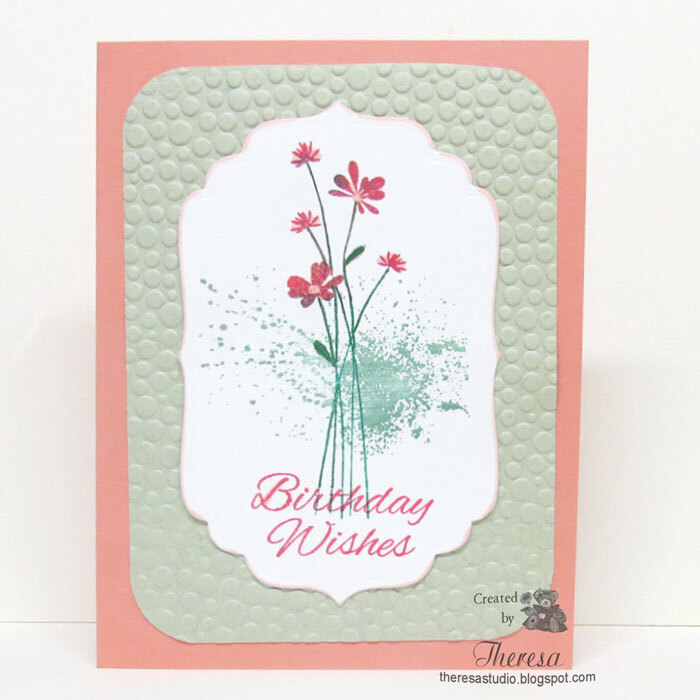 I used a coral card base and a minty green layer embossed with EF Bubbles. I adhered the image after using a die cut and inked the edge with a Copic. 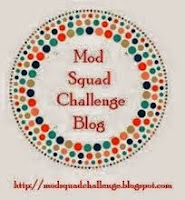 Mod Squad Challenge Blog: Celebrate your inner splatter. My splat was made with a stamp. Hello! 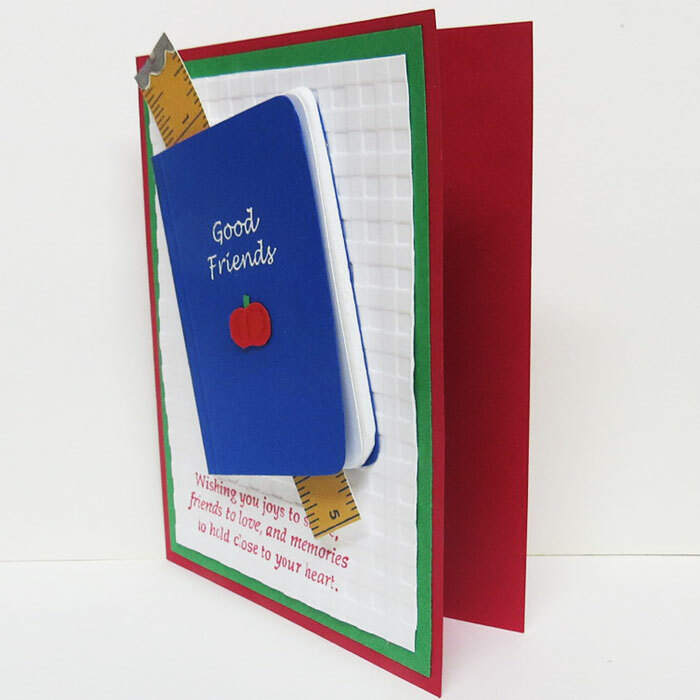 Today I am playing with Christmas cards.....no time like the present to begin making holiday cards. I am playing with a pink and silver theme. 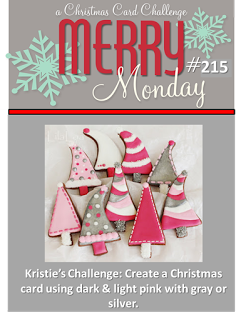 I cut the Marianne Christmas Bauble die from Metallic Silver CS and used a circle of Pink Vellum to back it. 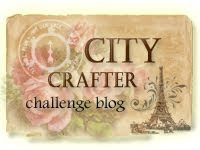 My card base is a Shimmering Pink Pearl CS from Crafter's Companion. I heat embossed a verse from Penney Black's Wonder Collection with Silver EP. Added some Pink Satin Ribbon to the ornament. This quick and simple CAS card was made with a Power Poppy digital stamp colored with Copics and placed on a card base of Brown CS with a mat of Authenique Pattern Paper. 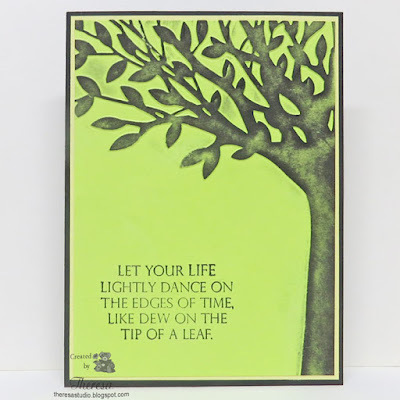 The image was framed with Brown CS cut with Nesties oval dies. I created the bouquet by using Photoshop to layering the flowers. I think this makes a nice notecard or I can add a verse when sending the card for a specific occasion. Welcome! 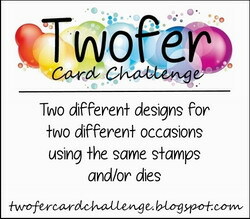 Today I have a card that was inspired by the Photo Challenge at The House That Stamps Built shown lower left. 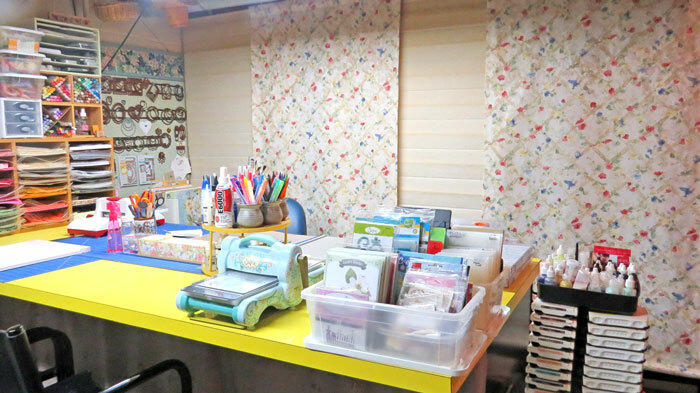 When I saw the yellow ruler in the photo, I remembered some leftovers of a tape measure that I created for a card some time ago-I had scanned an actual tape measure and then printed out my own patterned paper. Once I found the leftover "tape", I began my card. I decided to create a Blue Book titled "Good Friends" with Blue and White CS with an insert of Fun Foam and placed the ruler inside for a book mark. 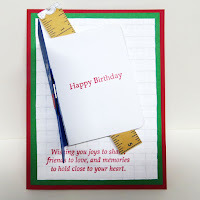 The card evolved into a Birthday card when I decided to make the book open to reveal Happy Birthday on the first page using a Repeat Impressions stamp. I added magnets (recycled from an advertising brochure) as a closure for the cover. I used a Red Card Base with a layer of Green CS and a layer of White CS embossed with Gingham EF (to pick up the colors and texture of the cupcakes in the photo). All stamps are from Repeat Impressions. The apple was cut freehand as a finishing touch to the cover. Fall is here! At least according to the calendar. 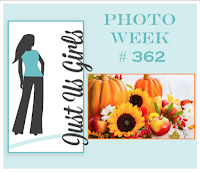 Yesterday, with fall colors in mind, I colored Power Poppy Olive and Oak digital image after printing on White CS. I distressed the edges with Distress Ink Wild Honey and attached to a Pattern Paper from Teresa Collins World Traveler pad. I like the combo of this paper with the image ....just looked good together. I added a card base of Pumpkin Spice CS. 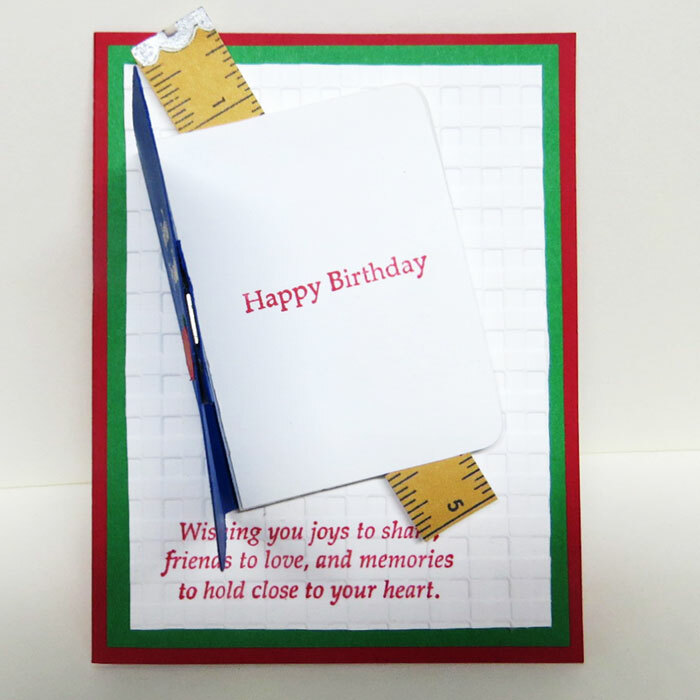 I could not decide on a sentiment so I will wait until I use the card and determine that. 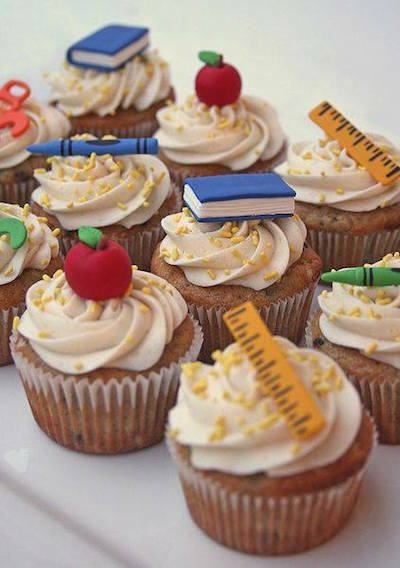 I think this would be good to use for a fall birthday, thanksgiving, thank you, or simply to say hello. What purpose do you think it would be appropriate for? 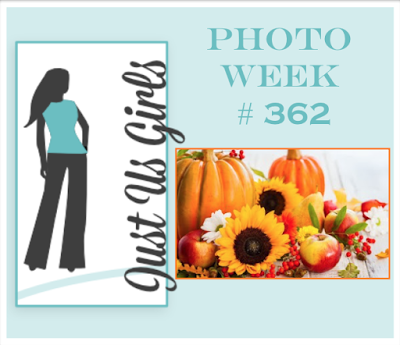 613 Avenue Create: Challenge 189 Anything Goes with optional twist of The Colors of Fall. Cards in Envy: Goodbye Summer, Hello Fall. Use fall colors or fall themed cards that fit into an envelope. Hello! 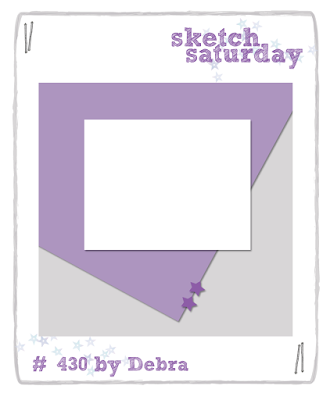 Today my card is made with a sketch from Sketch Saturday challenge but I gave it a turn. I printed the Power Poppy digital image from Apples in Season on white CS and colored with Copics. 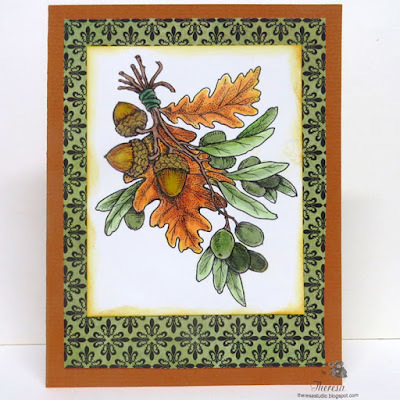 I placed this on MME patterned paper and then a card base of GKD Grass Green CS. 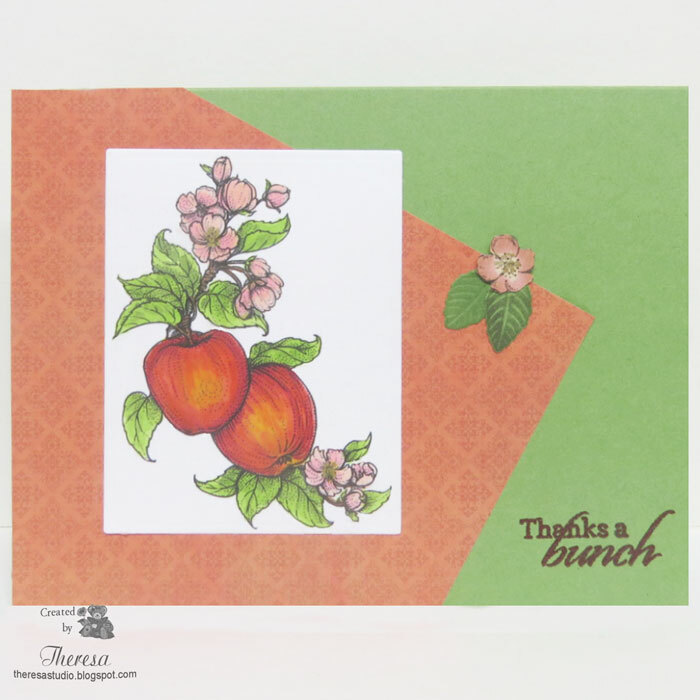 I added some die cut leaves and a blossom fussy cut from a scrap of Graphic 45. The sentiment from Flourishes Zinnias set was heat embossed with Red EP. I think this is a great card for this season. 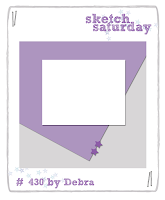 Sketch Saturday: Week 340 shown below. Hello! 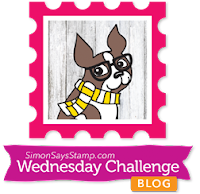 The challenge at Stamp TV Mix It Up Monday challenge is to Make A Scene. 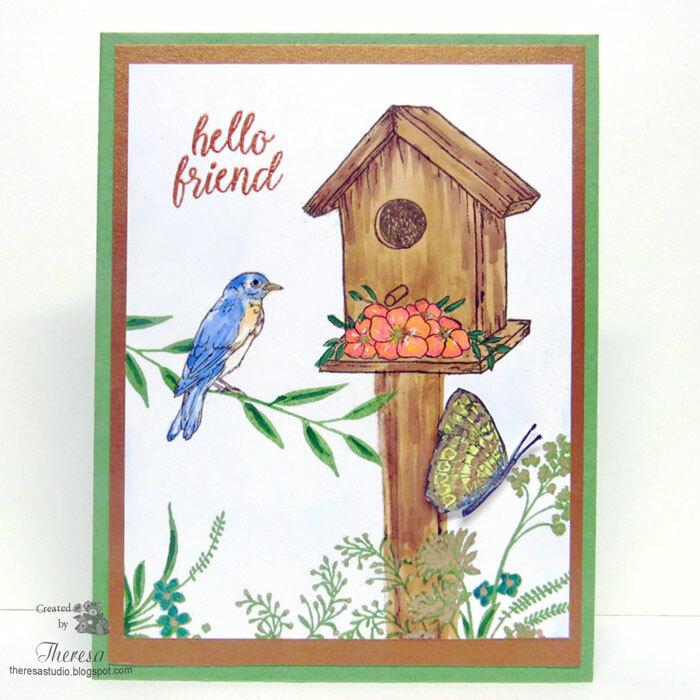 I decided to create a outdoor scene of a Bluebird sitting near a bird house as if he were protecting the house or waiting for another bird to exit. I drew in the post for the birdhouse. I often see birds sitting in this manner by our bird houses. To finish, I popped up a fussy cut butterfly checking out some of the blooms. I used metallic and glitter pens to color in the flowers. Sponged some blue ink in background. Cardstock-White, GKD Grass Green, DCWV Metallic Copper; Assorted Copics; Sakura Gelly Roll Glitter and Metallic Pens; Copper EP. 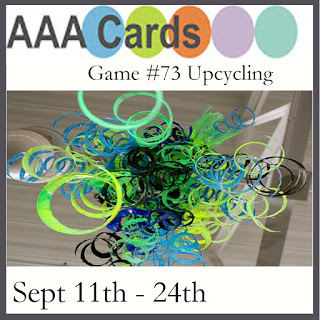 House of Cards Challenge: September challenge -Add a bird and/or use colors. I used a bird on my design. Hello! 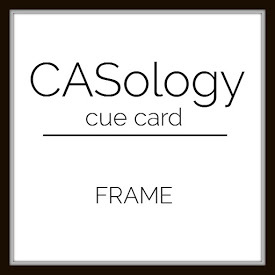 My card today is a Clean and Simple One Layer card. 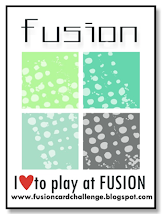 I used a NBUS Heidi Swapp swirl stamp that I decided would be perfect for my design. This was stamped with Versafine Onyx Black ink on White CS as well as a verse from Power Poppy Dahlias set. I added some score lines to frame the image. I inked the edges with a Black Copic marker to finish. I was pleased with the simple but elegant result. 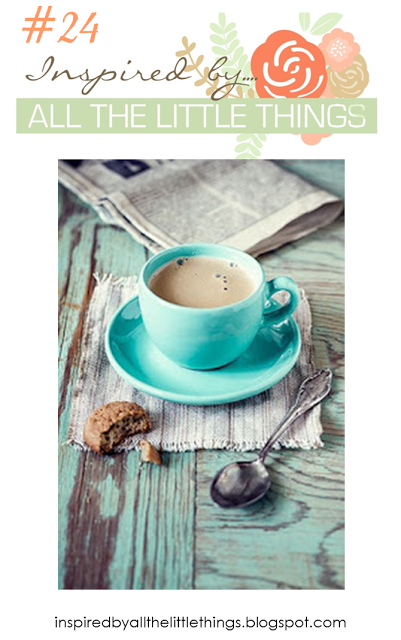 My post today is a card that I made for the challenge Inspired by All the Little Things #24 shown below. I started by creating a background with an Aqua CS that I embossed with a Woodgrain EF and inked with brown and caramel inks. 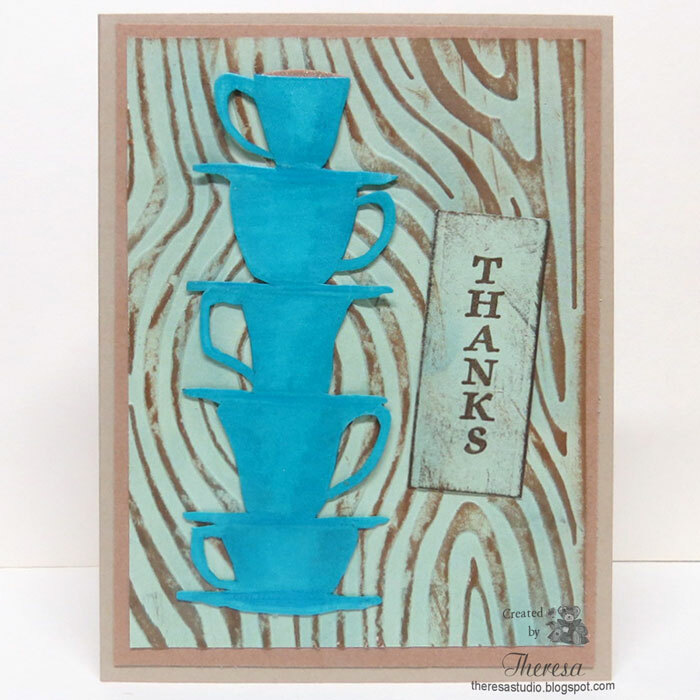 I stamped the Stack of Cups with a MFP stamp from Oh Beans set on Blue CS with Versamark and embossed with Clear EP. Did some shading with markers and then fussy cut the cups. Assembled the card with 2 shades of Kraft CS. Added Thanks sentiment stamped with a Repeat Impressions stamp with Brown ink. Welcome! This is my third post today. Spent some time this weekend in the studio. 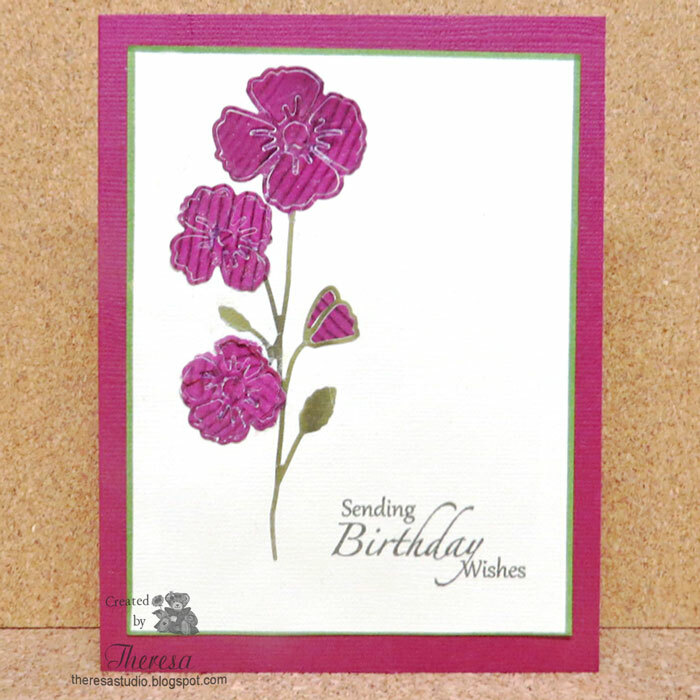 I was thinking of several challenges as I made this card using stamps from Repeat Impressions Happy Cling Set. I stamped the words on White CS with Memento Tuxedo Black and SU Ruby Red inks and cut with an Oval die and then embossed with Gingham EF. I attached this to a Black CS mat and a card base of Red CS. Decided it needed some happy butterflies that I cut with a Cheery Lynn die. 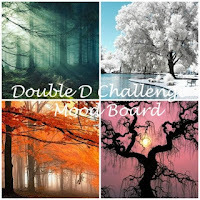 Mod Squad Challenge: What's That You Say? Use sentiment as focal point. 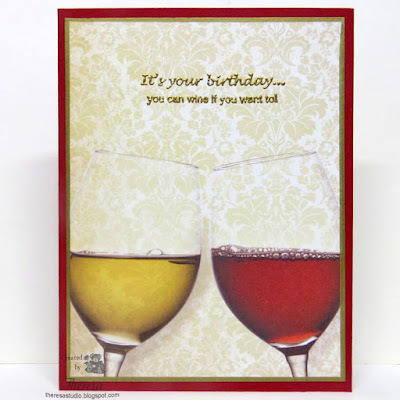 Wine for your Birthday or Whine? Hello! 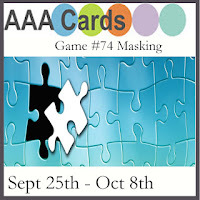 I have a card to post that was very quick and easy to make. I made use of some patterned paper by Paper House from At The Vineyard paper pad. I trimmed the paper and edged with a Pilot Metallic Gold Marker (easy way to give a layered look without the weight) and attached to a Wine colored card base. I stamped a Repeat Impressions sentiment from the Wine Time Series with Versamark ink and heat embossed with Gold EP. How easy can that be? My DH was amused by this card. Made him laugh out loud. 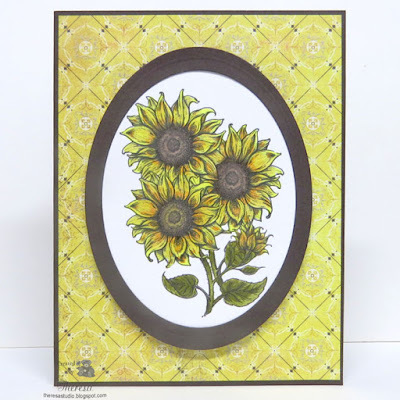 Craftyhazelnut's Patterned Paper Challenge: Use patterned paper on card. Hello! 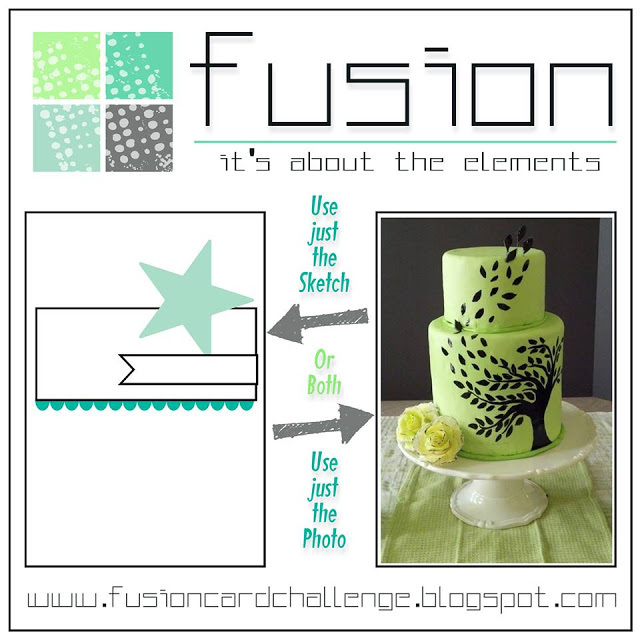 I saw the challenge at Fusion (shown below) and immediately thought of a Darice embossing folder called Leafy Tree and was inspired by the photo to create this card. I simply embossed a Lime Green CS with the folder and inked the raised areas with Memento Tuxedo Black ink. I stamped the GKD sentiment from A Year of Leaves with the same ink. 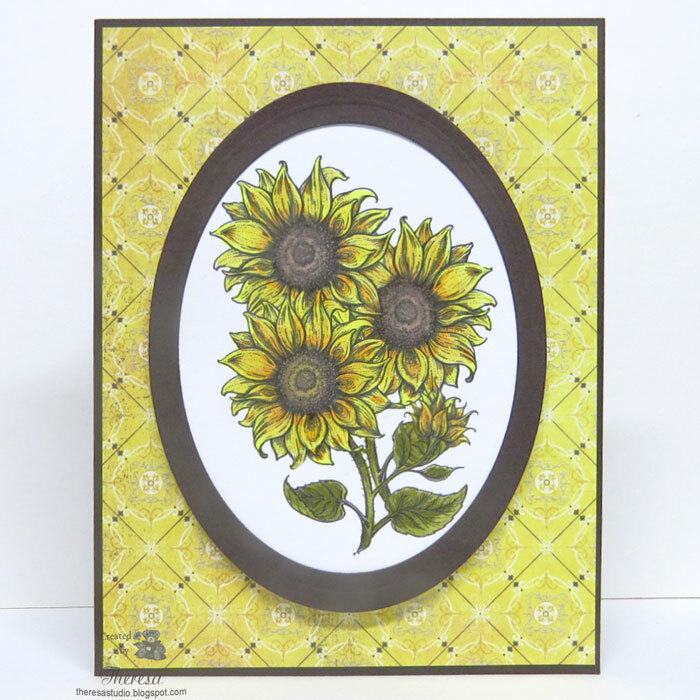 Finished with a yellow mat(used the yellow from the photo) and black card base. How simple but I think it fits the challenge. 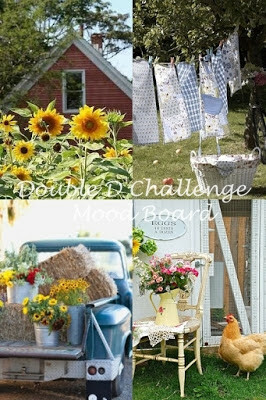 This is a fun challenge and I am glad that it has returned after a summer break. Make sure to check out their new look as well as the challenge. Hello! I was inspired by the colors and the roses in the photo inspiration challenge Fall Floral at Curtain Call. 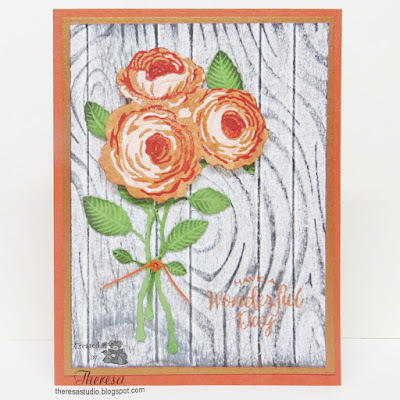 I chose to use Gina K Stamps Old Country Roses to make roses with Memento Potter's Clay, SU Ruby Red, and Memento Rhubarb Stalk inks for the 3 step stamps. I fussy cut the blossoms and chose to die cut stems with Memory Box English Rose Stem die cut. I cut the stems and leaves from GKD Fresh Asparagus and inked them to highlight the details. I assembled these elements on a background that I made with an EF Woodgrain, Scor-pal, Gray Flannel ink, Creamy Caramel ink, and white CS. I placed it on a mat of Copper Metallic CS and then a card base of Rusty Orange. The GKD sentiment was stamped with Versamark and heat embossed with Copper EP. Finished with a bit of Orange Twine. I must admit that the photo does not do justice to my card...did not capture the depth and texture.....it looks so much better in real life. Trust me! 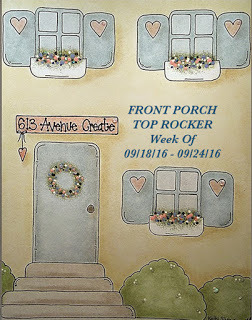 Crafty Sentiments Designs: Use favorite stamp or image. 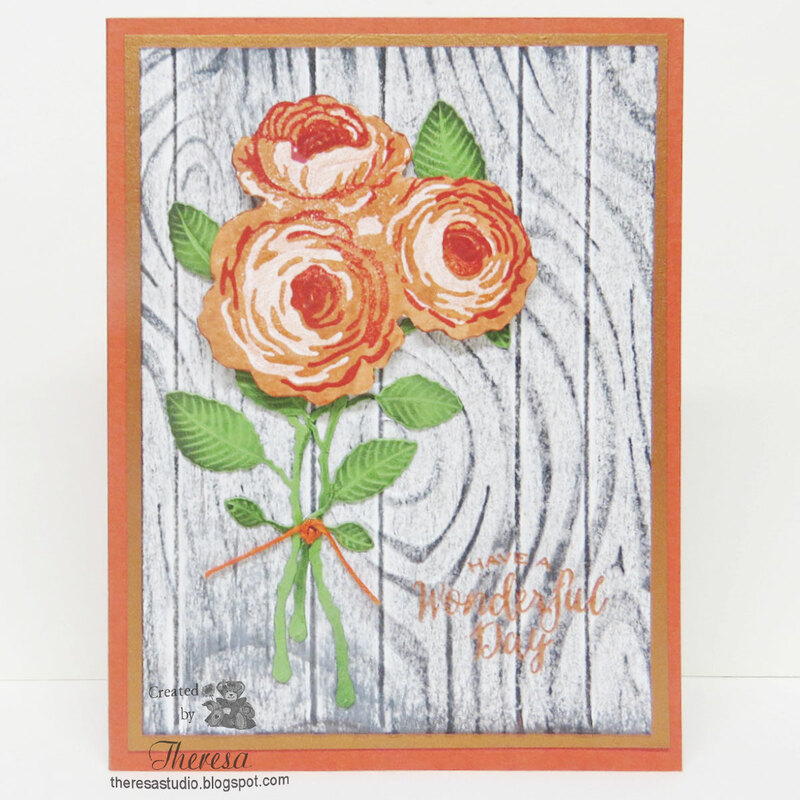 Roses are a favorite image of mine and this rose stamp is a new favorite. Hello! 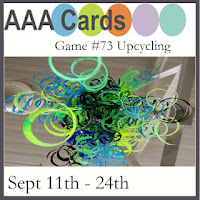 For the AAA Cards challenge we are to feature something that we've re-cycled on a CAS card. 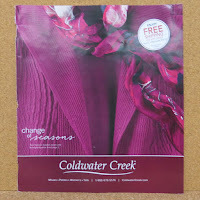 I decided to use a Coldwater Creek catalog and cut some of the pages with a Memory Box die for my design. I am showing the cover that I used to cut the flowers and I used another page for the stem of the flowers. I stamped a GKD sentiment with SU Always Artichoke ink and edged the image layer with a green marker before adhering to a wine card base. Welcome to the studio! 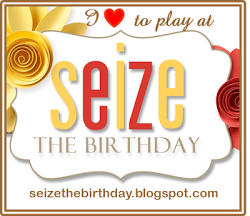 Today I have been playing with a new digital stamp from Power Poppy called Sunshine of My Life. After printing the image, I colored with Copics and added some dots with a Metallic Glaze pen. 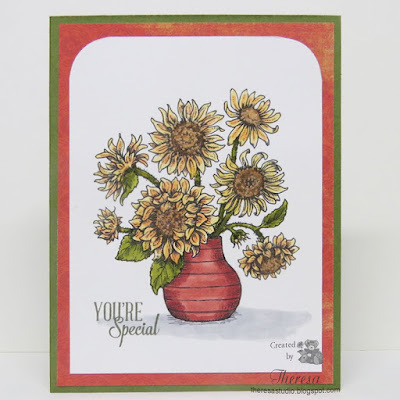 I stamped a sentiment from Power Poppy with SU Always Artichoke ink. 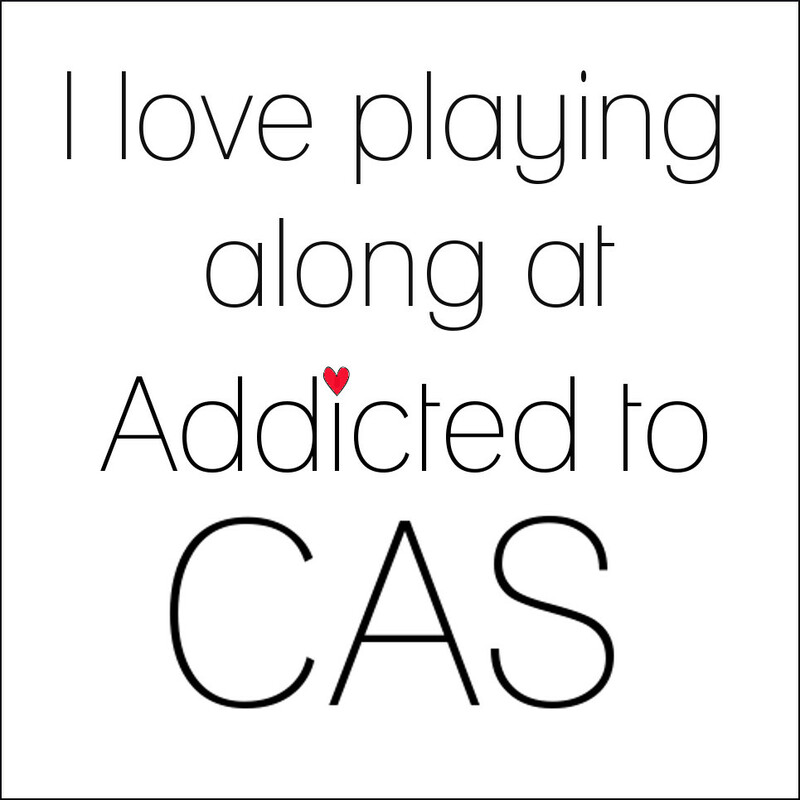 I kept the design CAS using a card base of GKD Fresh Asparagus CS and a mat of pattern paper from MME. 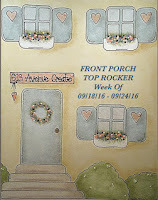 I will be entering this card into the Passionate Paper Creations Coloring contest on face book. 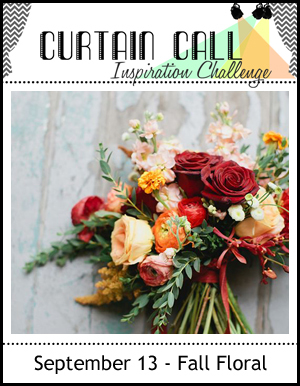 Curtain Call: Fall Floral Challenge. Inspired by the colors and flowers. 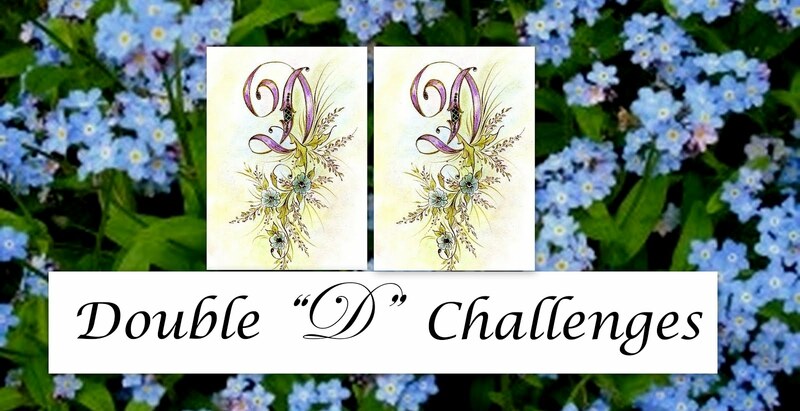 Double D: Down on the Farm Challenge. My sunflowers look like they just picked on the farm.